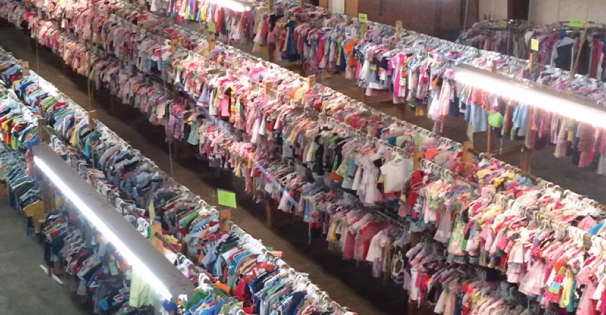 At Sweet Repeats you will find great quality children's clothes (preemie-child's 16/18); shoes (infant-large child's 5/6); toys, baby furniture and equipment and much more, at a fraction of the cost of buying these items new! We are a semi-annual consignment sale (Spring/Summer Sale and Fall/Winter Sale). Each sale lasts two weeks and is always full of a great variety of merchandise. Our consignors get a chance to shop first, followed by our public sale. Plus, it pays to consign! Visit our Consignor Info page for more details! Please remember, consignors must preregister for each sale in order to participate. Make sure to LIKE OUR FACEBOOK PAGE for details before and during our sale. It is the best way to get the most current information about Sweet Repeats! 1/2 price most items Friday APRIL 5 & Saturday, APRIL 6-Tag will say if an item discounts! ﻿We are located at the former Oxford Custom Door Building, located just off of Highway 78 next to Bettaview Church (between Quintard Mall in Oxford and Coldwater). This is an industrial looking building...don't let it fool you! It is packed with awesome bargains for your little ones! Registration is OPEN. Click below to register! Once you pay your Participation Fee ($8.50) in Paypal, MAKE SUREyou click on the yahoo email address To complete your registration. Our system will not recognize you as a paid consignor if you do not do this important step! *REMEMBER YOU MUST SCHEDULE A DROP OFF TIME. We will be inspecting items prior to accepting them into the sale. During the sale consignors can click on "Returning Consignor" and log in to My Sale Manager to see how much they have sold. We update as frequently as possible. Copyright 2015 Sweet Repeats. All rights reserved.